Hey Guys! Long time no blog! I'm coming back from another absence, I'm sorry! Mr. Aggies Do It Better has been traveling a lot so all of my time as been spent holding down the fort! Not much time for nails and no time for blogging. Hopefully I'll t back to my normal schedule this month! Happy October, my birthday month! I also got my birthday present a litte early....I have been way overdue for an upgrad on my iPhone 4S so I have a new baby...iPhone 6! yay! I use it to take almost all my pics so hopefully yall will notice a difference! 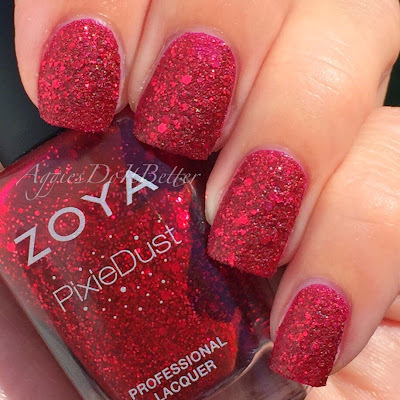 Today I finally have my review of the new Zoya Pixiedusts! 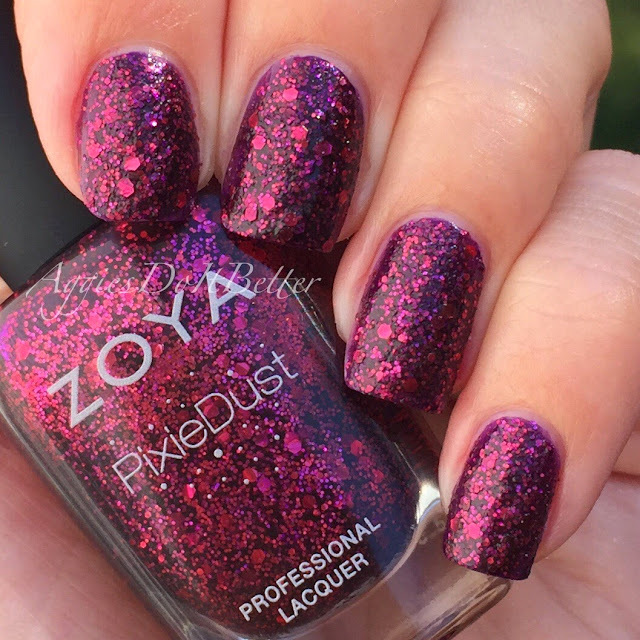 They are called "Ultra" Pixiedusts, they are not holographic like the magical ones, but they do have the chunkier texture, more so than the original Pixies. One of my bottles was broken so by the time I waited to receive the replacement, the Mr. had started his travels so this blog is way over due! First up is Oswin, which is red glitter in a red jelly. Several people have noted that this was the only one that dried matte like the previous Pixiedusts and that was the same for me. It's very Christmassy! I used 2 coats, one thin and one medium. I do tend to dab a little to get even coverage. Next is Arianna. I actually wore this one for several days when I first got my samples! 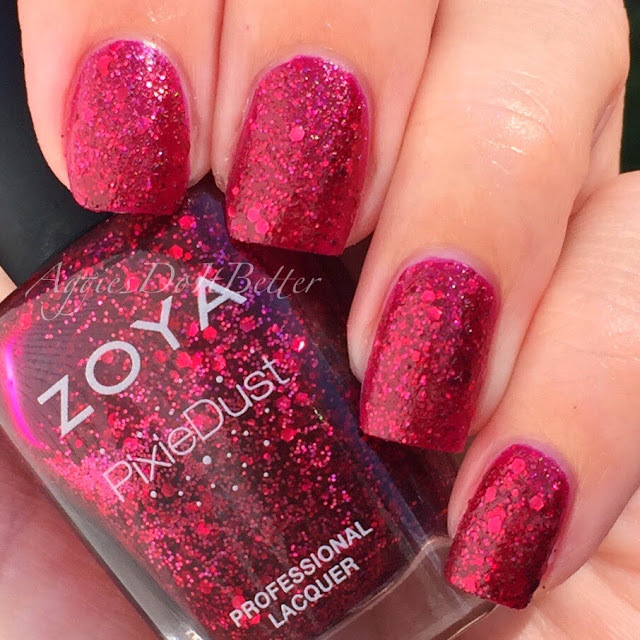 The red glitter seems the same as Oswin but jelly base is more of a darker cranberry red than a true red, which overall makes it look juuuuuusttttt a tad darker than Oswin. It doesn't dry as matte but wear time is excellent on me. The whole time I was wearing it though I kept thinking...Its so Christmassy haha. I think it will be perfect for the holidays. I used 2 coats as well here. Next is Noir, the one I was the most excited about and the one that arrived broken :( I was super sad! This one is my clear favorite and everyone else it seems! It is plum colored glitter in a dark purple base. Its sooooooo pretty guys, I can't even. I don't have anything else remotely like this! I used 2 coats, same application as mentioned in the others. It's a little dark for me to wear now, because I'm in serious denial that summer is over :( but this will definitely be a weekend go-to for me in the coming months!